Hunkar Begendi means Sultan (King) enjoyed it, there is no doubt this is one of the most delicious dish introduced by the cooks of Ottoman Royal kitchens. The history of Ottomans needs no introduction as they were the super power of their time and after Alexander the great ottomans were the only people to rule over Euro Asia till the British. They were the people who enjoyed two things more then anything else conquering and eating, they loved both and their cooks competed amongst each other to cook the best food just like their soldiers did in battlefield to conquer. This simple and delicious dish is second to none in taste and simple to make, its basically a lamb stew served on a bed of aubergine. 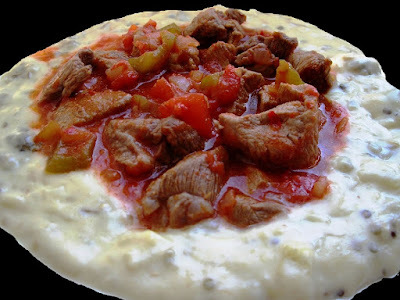 The first stage is to make a tomato based lamb stew and you can do this either the day before you want to make Hünkar Beğendi. If you like it please do use comment box below and do not forget to subscribe our site to get new recipes everyday, we don't just share the recipes from around the world, we dig the history for you to bring some of the best recipes for you and we bring the memories of ancient life into your kitchen. In a pan add butter and melt it on medium flame, add meat and cook til the meat is brown, add onion, ginger & garlic paste and cook for 6 minutes, add lemon juice and mix well, add tomato puree and chopped tomatoes, add 1 cup water and mix well, add salt and pepper, stir well. Once your stew is simmering, put a lid on the pan and turn the heat to low, cook til meat is softened and gravy is thickened, remove from the stove and set aside. In a pan melt the butter on medium flame, add plain flour (stir it continuously), once it becomes thick, add milk slowly (stir it continuously). 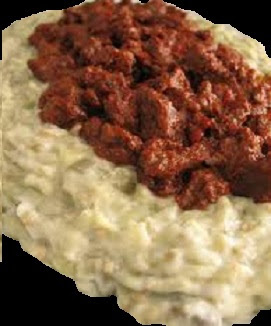 Now add your grated cheese and keep stirring until your 'beğendi' sauce has thickened enough to make a suitable nest for your lamb. To serve, share the beğendi sauce between your plates, making a little nest in the center of each. 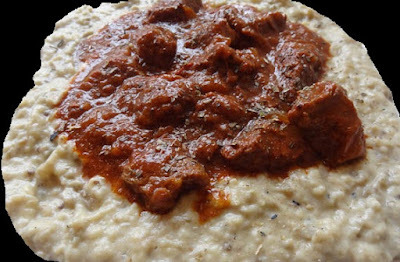 Now spoon the lamb stew into the nest and allow the sauces to run over the eggplant puree. Sprinkle the coriander over the lamb and serve up your Hunkar Begendi.